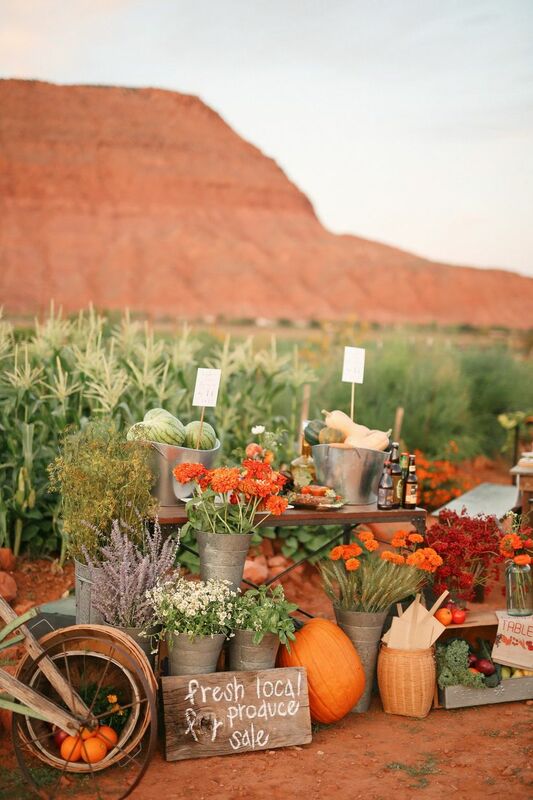 The majestic red rocks of southern Utah provided the stunning backdrop for this styled shoot, inspired by locally-grown produce and fresh farmers market elements. 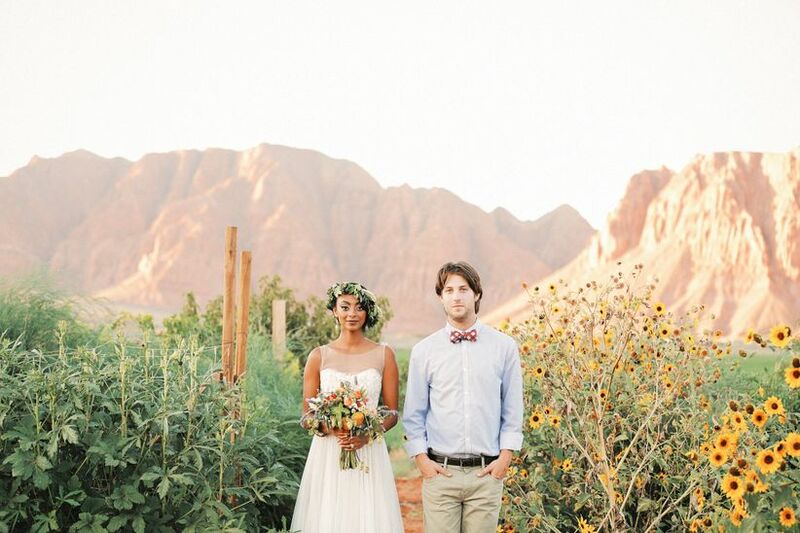 The majestic red rocks of southern Utah provided the stunning backdrop for this styled shoot, which was inspired by locally-grown produce and fresh farmers market elements. 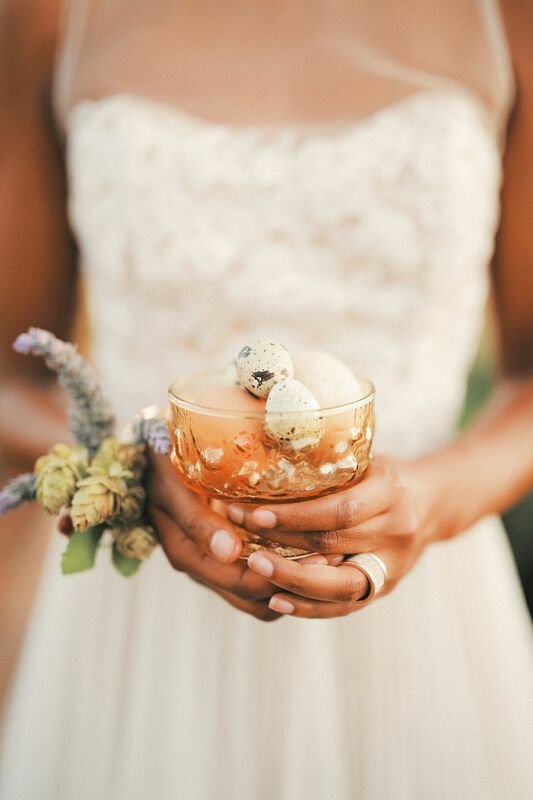 Set in a community garden, this shoot is filled with all the details needed for a beautiful soiree: inviting tablescapes, lush bouquets, mouthwatering food, and smiling faces. 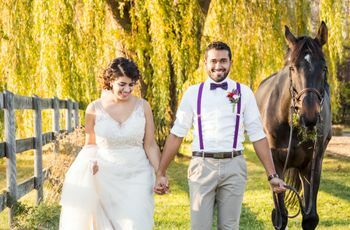 See all of our favorite details of this styled session filled with farm-to-table wedding ideas! 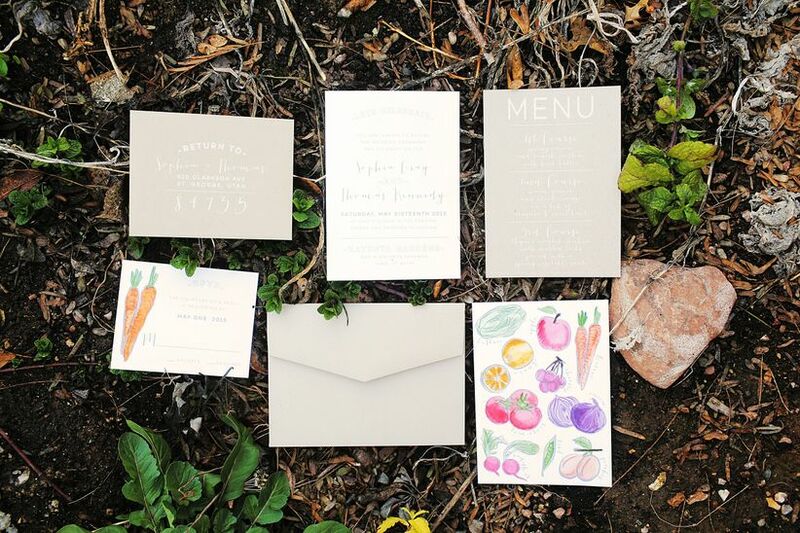 The invitation suite was kept simple with a neutral color scheme, incorporating watercolor vegetable motifs for a hint of color and whimsy. 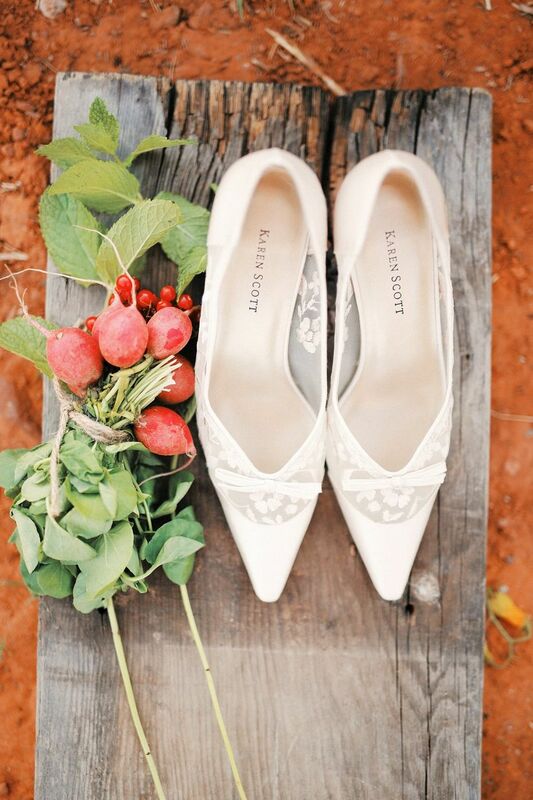 The bride accessorized with a pair of white high heels by Karen Scott featuring lace detailing and sweet bows. 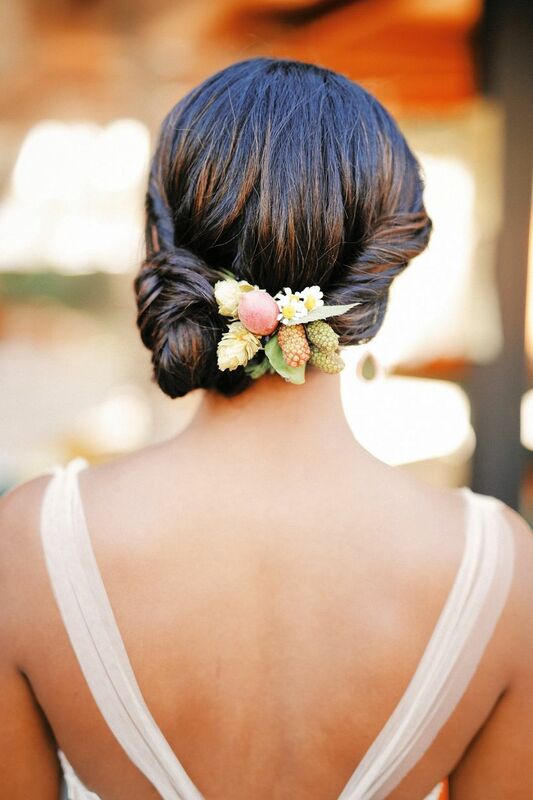 She added fresh greenery, berries and chamomile flowers to her sleek chignon. 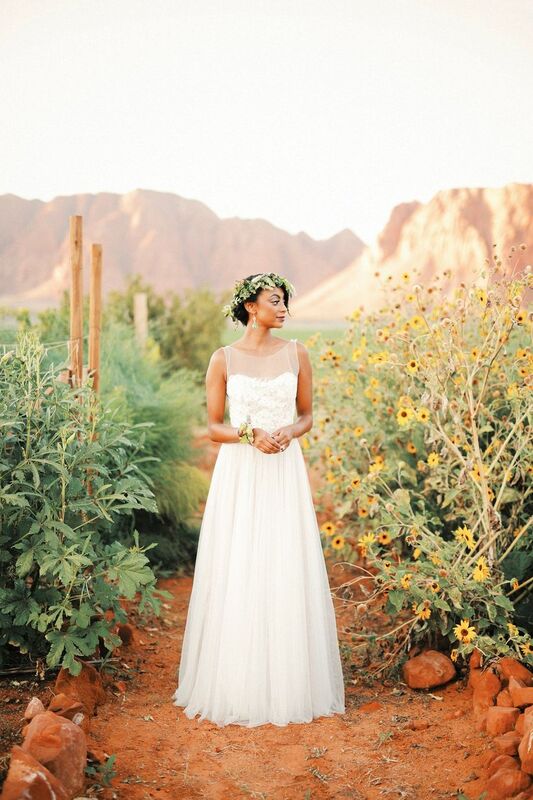 We can't get enough of the model's gorgeous A-line wedding gown! The tulle skirt and lace bodice combo is oh-so-romantic. 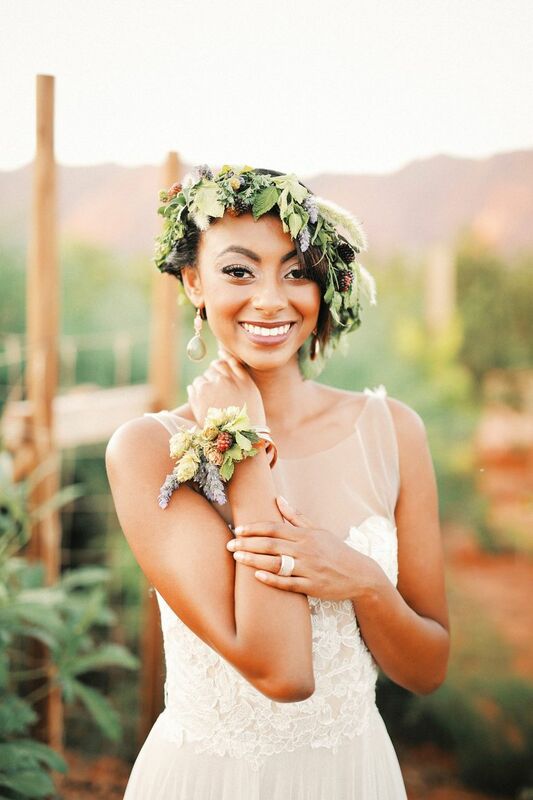 Her fresh greenery crown added a hint of boho flair. Love it! 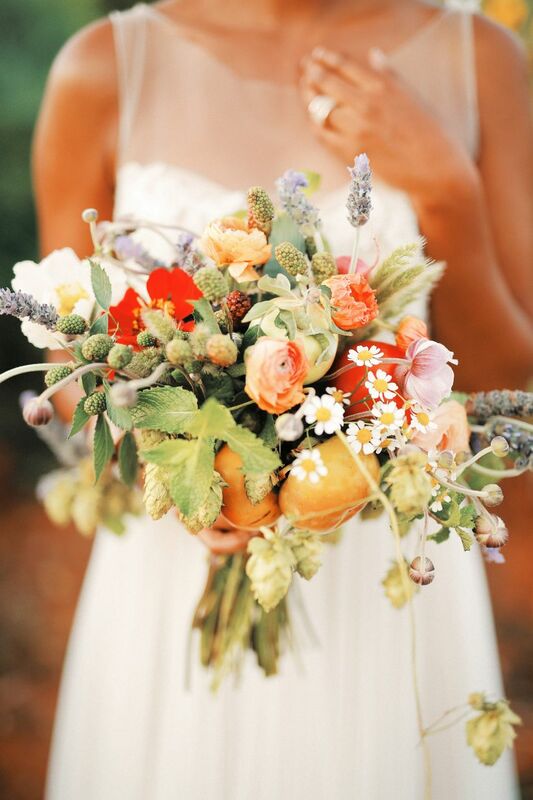 The bouquet was overflowing with ranunculuses, chamomile, hops, wild berries, and even vegetables, including tomatoes and radishes. How romantic is that golden sunset glow? 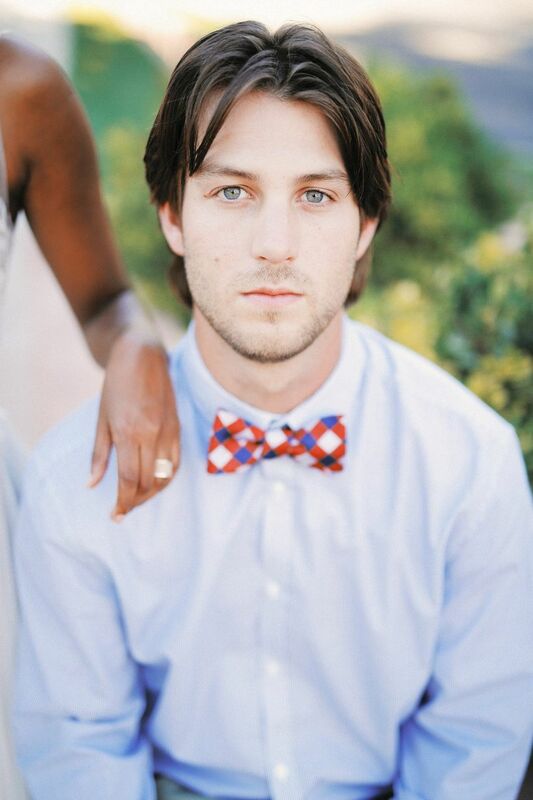 The groom kept his look casual but polished in a blue button-down shirt and red checkered bow tie. 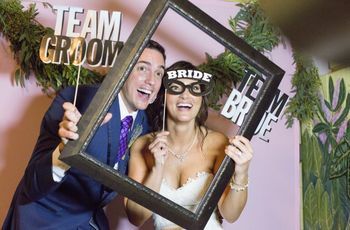 "Every element of this wedding is meant to inspire brides to use the elements around them: everything from choosing a venue to decor to a menu for the wedding day," said Jimmy Bishop of Gideon Photography. 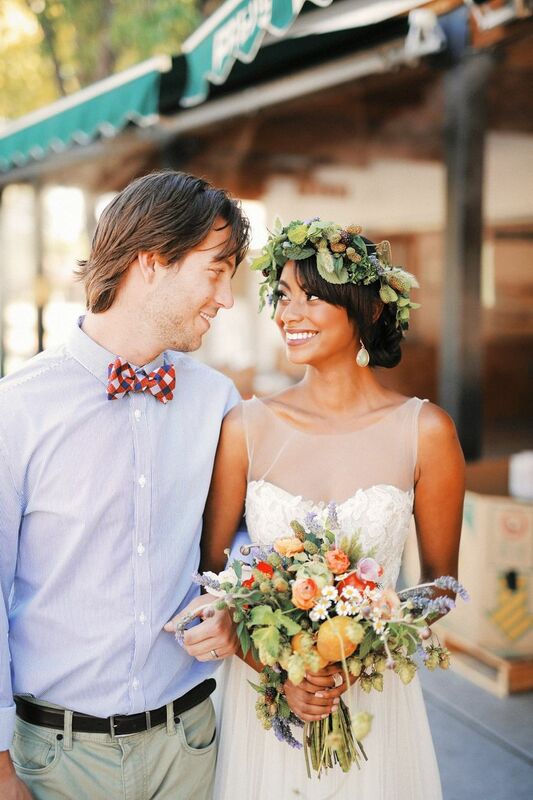 "The inspiration for the shoot was a farmers market, farm-fresh vibe," Bishop said. 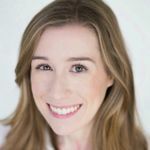 "People don't usually associate the desert of southern Utah with fresh crops of amazing fruits and vegetables, but for the past 150 years, that has been the case in the region." 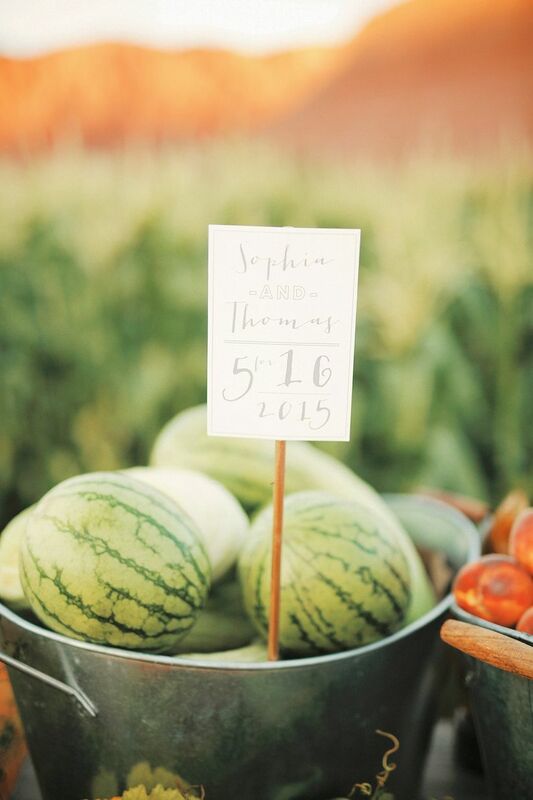 Buckets of fresh fruits and veggies doubled as decor. 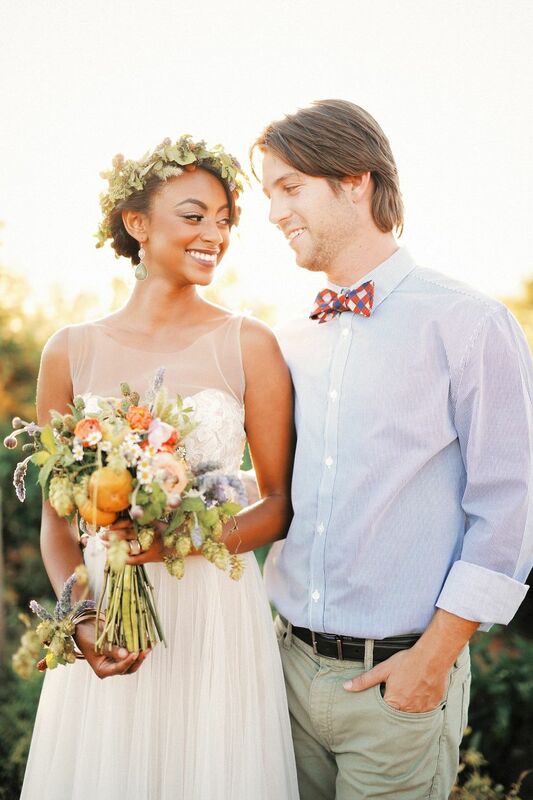 We love this idea for a summer or fall wedding! 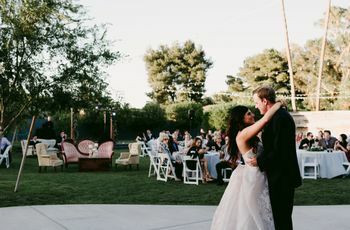 "I love the idea of contrasting the desert with the beautiful green of the garden and a table setting that screams fresh," Bishop said. 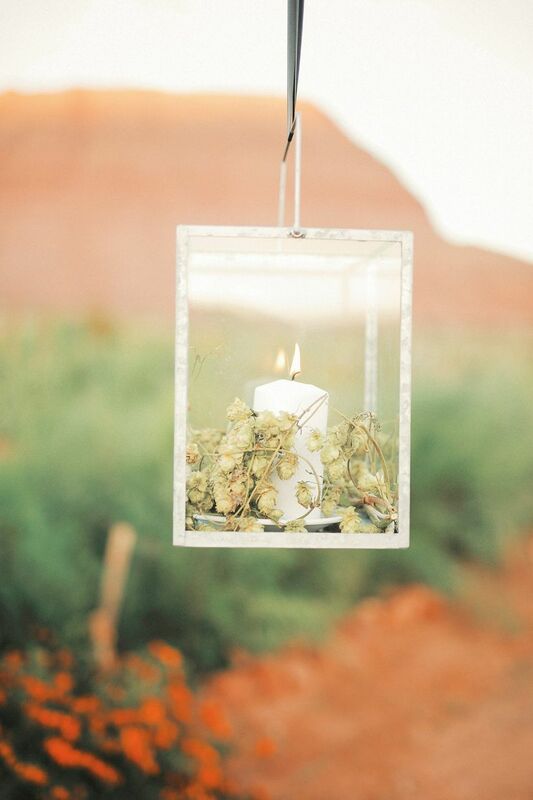 Candlelit lanterns hung above the table. Simple but sweet! 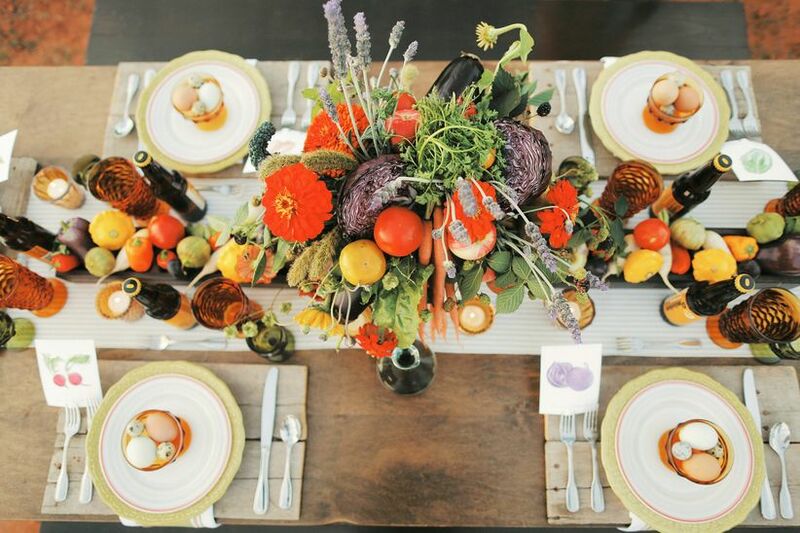 Wedding favor inspiration: This bowl of colorful hen eggs is practical and cute! 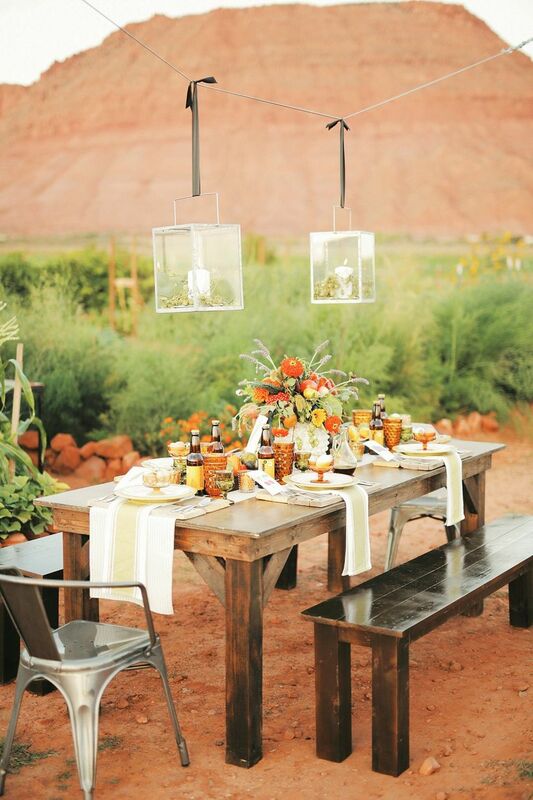 Wooden pallets were used as place mats at each setting to create a relaxed, farmhouse vibe. 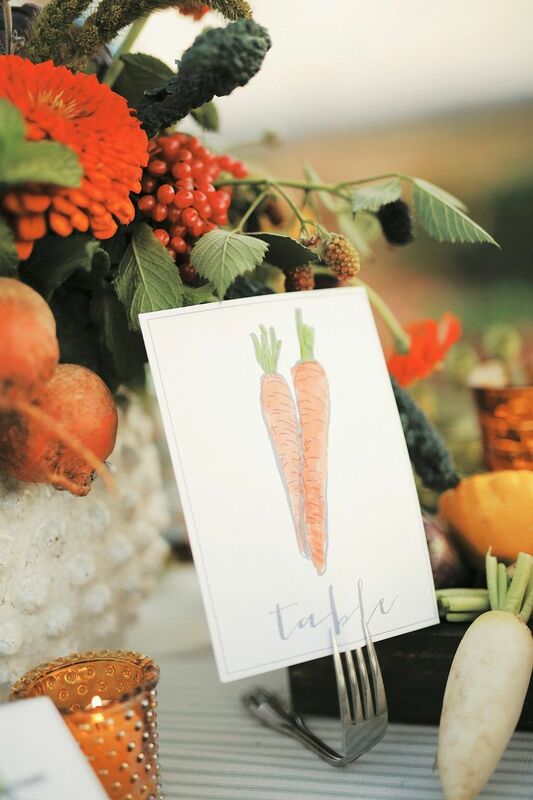 "The paper products were hand-painted to go along with the organic and fresh theme of the shoot," Bishop said. 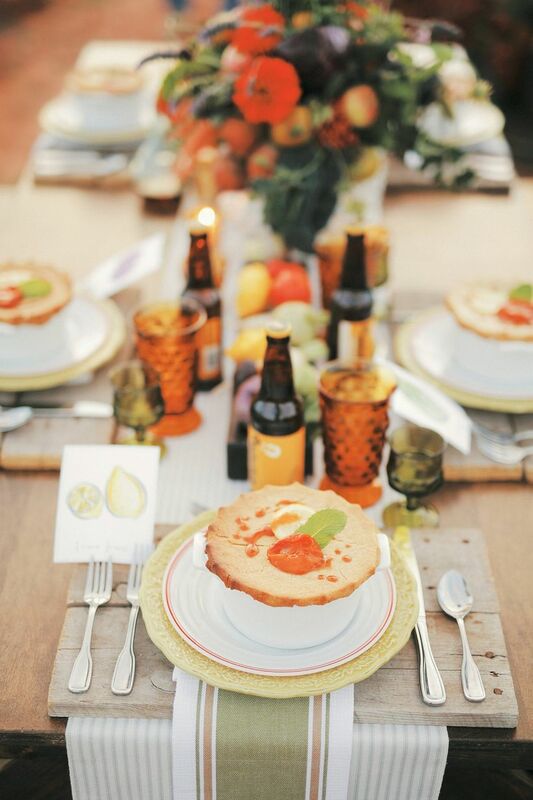 Locally-grown ingredients were used in all of the dishes, including this vegetable pot pie! 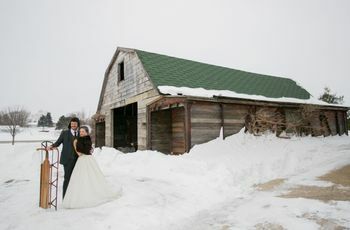 "I love the idea of supporting local growers and farmers and incorporating their goods into the wedding," Bishop said. 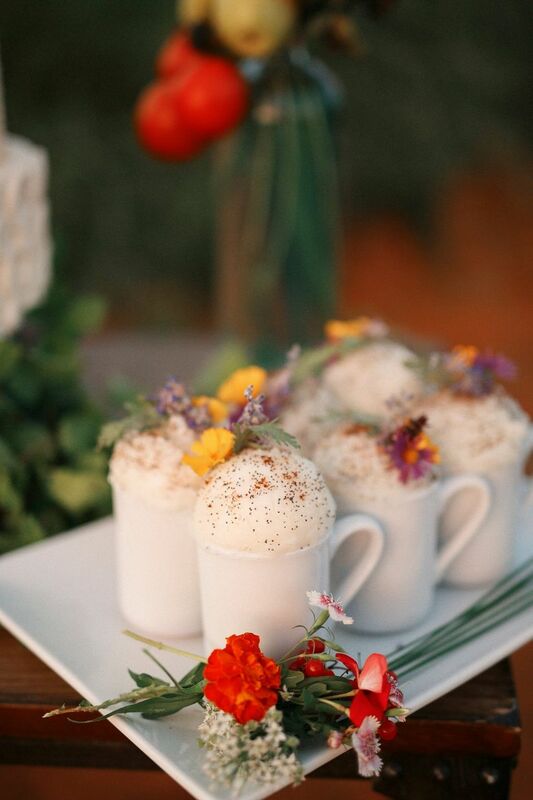 Dessert included coffee drinks garnished with just-picked flowers. 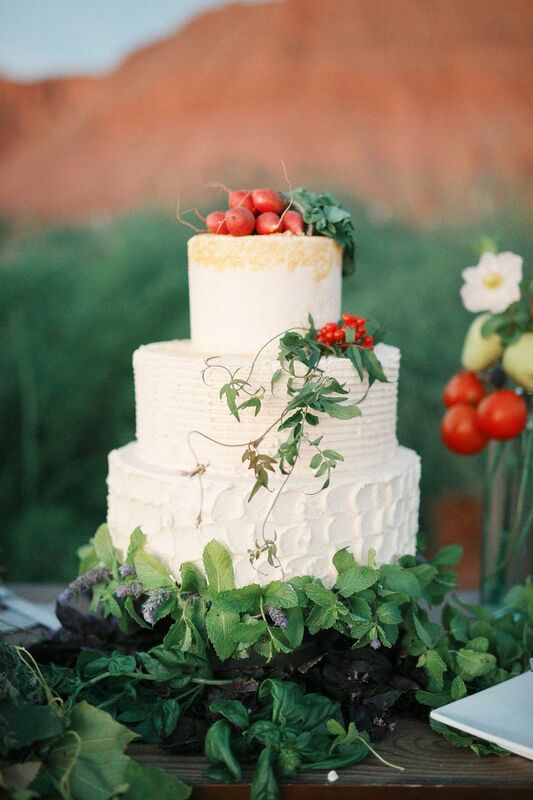 Radishes, fresh greenery and gold sprinkles topped the classic buttercream cake.